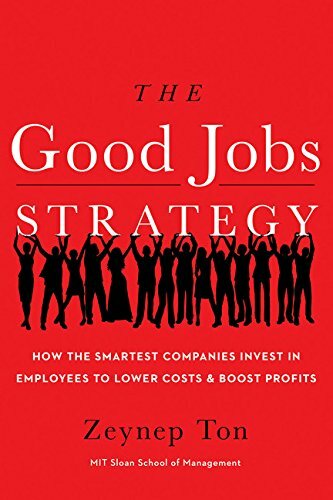 Book Review: The Good Jobs Strategy — Toister Performance Solutions, Inc.
What do Costco, Trader Joe's, and In-N-Out all have in common? You might immediately think of their cult-like customer following. Or, perhaps you're drawn to their great products at reasonable prices. You may even think about their reputation for outstanding customer service. These companies all have something else in common. They invest significantly more in their employees than their competitors. That's the core lesson from The Good Jobs Strategy: How the Smartest Companies Invest in Employees to Lower Costs & Boost Profits by Zeynep Ton. Investing in your employees doesn't have to come at the expense of profits. A few smart companies have figured out how to succeed by creating better jobs for their employees. Ton focuses on jobs in retail, a traditionally low-wage industry. She also gives examples from fast food companies like In-N-Out and other industries where wages are typically low. Ton explains in detail how these companies make a strategic choice to combine high-caliber employees with operational excellence. Fewer products, so employees can be experts. Lower turnover costs, because employees like working there. They've figured out how to empower their employees. Employees are expected to share customer feedback. They've learned to make smart trade-offs to focus on what's important. This book was an enjoyable and inspiring read. It proved that companies can become successful by truly treating employees like their most valuable asset.